NEW YORK, New York — As the annual Board of Trustees meeting of the Hayastan All-Armenian Fund is underway, the Fund has happily announced the completion of multiple projects throughout Karabakh. Sponsored by the 2011 Telethon as well as the government of Nagorno-Karabakh, two of the 13 zones of Stepanakert’s 140 km-long water supply system have been successfully reconstructed. Built in 1950, residents in the numerous villages fed by this water main only had access to water for two hours per day. They now have water 24/7, increasing their productivity and allowing them to lead lives not dictated by their limited, scheduled access to what is, ironically, the very basis for life. In further keeping with the 2011 Telethon’s “Water Is Life” theme, the 1,500 residents of Noragyugh village in Karabakh’s Askeran region now also have continuous access to potable water. The project was financed by the Hayastan All-Armenian Fund’s French affiliate as well as prominent Armenian businessmen from Russia. Moving from water to land, the principal access road into Shushi in Karabakh is now operational. The 800 m-long Ghazanchetsots Street, formerly a dirt road, was transformed into a paved highway that allows for safe, efficient and direct access to the center of Shushi. “At last the principal gate to Shushi has regained its original state, with a more modern access road,” said the Primate of Artsakh Diocese Archbishop Martirosyan during the highly-attended opening ceremony. Financing for the project came from a Hayastan All-Armenian Fund fundraising gala dinner held in Moscow in November of 2010, as well as from the government of Nagorno-Karabakh. 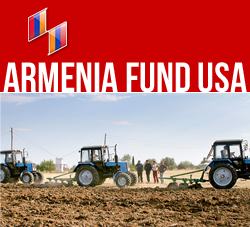 Rounding out a month of projects centering upon infrastructure development, the Hayastan All-Armenian Fund reminded its constituents of its variety of far-reaching and much-needed projects by announcing the completion of still another of its numerous education initiatives. On the eve of its 50th anniversary, the Togh village school in the Hadrut region of Karabakh now has an entirely renovated wing that includes a gymnasium as well as an art center, the latter to be shared with youth from ten neighboring villages. The U.S. Western Region affiliate financed the first half of the project and the 2008 Telethon the latter stage.